FreeOnlineGuitarLessons-FishingBlues Is A Ton Of Fun! FreeOnlineGuitarLessons-FishingBlues is one of the Coolest Free Blues Guitar Lessons Online. This is the first of several blues guitar lessons that are being planned. These free guitar lessons will teach a song and also look at the guitar chord theory that's used in the song. 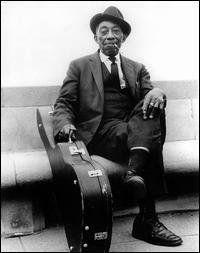 Fishing blues was written and originally recorded by Henry "Ragtime Texas" Thomas. It's closely associated with Taj Mahal who first recored it in 1969. The version in this FreeOnlineGuitarLessons-FishingBlues is based more on Taj Mahal's version than Henry Thomas'. You can hear the original Henry Thomas recording here and Taj Mahals here. The Henry Thomas recording that I've heard is in G#/Ab. This arrangement is in C because that's the key that I sing it in. If that doesn't work for you, try using a guitar capo to find a better key for your voice. To me, the thing that really brings this song to life is the right hand. The chord progression, and the chords themselves, are pretty simple. How long each note sounds is what sets the "feel" for the song. To control how long the note sounds, you have to damp the notes. String damping is simply touching the strings to stop them from vibrating. To do it with the fretting hand, you just release pressure on the strings. To do it with the right hand, lightly touch the string when you want the sound to stop. The only other thing that might be new to you is the use of descending triads in the introduction and solo. This is simply a way to harmonize a moving line. To hear the melody line, play just the highest pitched note in the triad. Need a refresher course on triads? It doesn't sound bad, just a little "naked". Playing that line using triads gives it a fatter, fuller sound. The introduction/solo is simply an instrumental version of the song. You can put that segment at any place in the song that you want to play it. I normally play it as an introduction and then again right before the first verse repeats at the end of the song. Here's a link to the sheet music. You'll find the complete lyrics under the "Score" button on the toolbar at the top of the tab. First click on '"Score" then on "Notes" on the drop down menu. To hear the MIDI playback of the song, click on the yellow loudspeaker on the toolbar. Please be patient. The lesson video is about 10 minutes long, so it may stream slowly for some viewers. Leave FreeOnlineGuitarLessons-FishingBlues and return to learn-fingerstyle-guitar.com's homepage. Ready to learn More Classic Blues Songs?